Lahore (Punjabi: لہور; Urdu: لاہور‎) is the capital city of the Pakistani province of Punjab. It is the second-most populous city in Pakistan after Karachi, and the 15th most populous city in the world. The city is located in the north-eastern end of Pakistan's Punjab province, near the border with the Indian state of Punjab. Lahore is ranked as a beta-world city, and is one of Pakistan's wealthiest cities with an estimated GDP of $58.14 billion (PPP) as of 2014. Lahore is the historic cultural centre of the Punjab region, and is the largest Punjabi city in the world. The city has a long history, and was once under the rule of the Hindu Shahis, Ghaznavids, Ghurids, and the Delhi Sultanate. Lahore reached the height of its splendour under the Mughal Empire, serving as its capital city for a number of years. The city was captured by the forces of Persian Safavid Emperor Nader Shah during his invasion of the Mughal Empire. The city was then contested between different powers before it became capital of the Sikh Empire, and then the capital of the Punjab under British rule. Lahore was central to the independence movements of both India and Pakistan, with the city being the site of both the declaration of Indian Independence, and the resolution calling for the establishment of Pakistan. Following the independence of Pakistan in 1947, Lahore became the capital of Pakistan's Punjab province. Lahore is one of Pakistan's most liberal and cosmopolitan cities. It exerts a strong cultural influence over Pakistan. Lahore is a major centre for Pakistan's publishing industry, and remains the foremost centre of Pakistan's literary scene. The city is also a major centre of education in Pakistan, with some of Pakistan's leading universities based in the city. Lahore is also home to Pakistan's film industry, Lollywood, and is a major centre of Qawwali music. The city also hosts much of Pakistan's tourist industry, with major attractions including the old Walled City, numerous Sikh shrines, and the Badshahi and Wazir Khan mosques. Lahore is also home to the UNESCO World Heritage Sites of Lahore Fort and Shalimar Gardens. A legend based on oral traditions holds that Lahore, was known in ancient times as Lavapuri (City of Lava in Sanskrit), and was founded by Prince Lava, the son of Sita and Rama while Kasur was founded by his twin brother Prince Kusha. The oldest authentic document about Lahore was written anonymously in 982. It is called Hudud-i-Alam (The Regions of the World). In 1927 it was translated into English by Vladimir Fedorovich Minorsky and published in Lahore. In this document, Lahore is referred to as a small shehr (city) with "impressive temples, large markets and huge orchards." It refers to "two major markets around which dwellings exist," and it also mentions "the mud walls that enclose these two dwellings to make it one." The original document is currently held in the British Museum. Lahore was called by different names throughout history. To date there is no conclusive evidence as to when it was founded. Some historians trace the history of the city as far back as 4000 years ago. Lahore had been called by different names throughout history. Ptolemy, the celebrated 2nd-century Egyptian astronomer and geographer, mentions in his Geographia a city called Labokla situated on the route east of the Indus River, in a region described as extending along the Jhelum, Chenab, and Ravi rivers which may have been in reference to the ancient settlement of Lahore. The earliest recorded definitive mention of Lahore was written by the Chinese pilgrim Hieun-tsang, who gave a vivid description of Lahore when he visited the city in 630 CE The oldest authentic surviving document about Lahore is the Hudud al-'Alam (The Regions of the World), written in 982 C.E. in which Lahore is mentioned as a town invaded by Arab invaders that had "impressive temples, large markets and huge orchards." Lahore is described as a Hindu principality in the Rajput accounts. 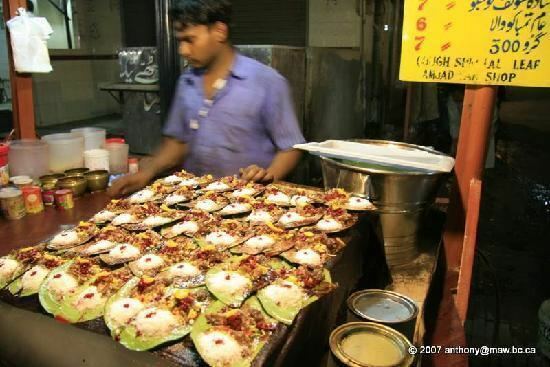 Keneksen, the founder of Suryavansha, is believed to have migrated out from the city. The Solanki tribe, belonging to Amukhara Pattan, which included the Bhatti Rajputs of Jaisalmer, "point to Lahore" as their place of earliest settlement. Lahore appears as the capital of the Punjab for the first time under Anandapala – the Hindu Shahi king who is referred to as the ruler of (Hakim i Lahur) –after leaving the earlier capital of Waihind. Few references to Lahore remain from before its capture by Sultan Mahmud of Ghaznavi in the 11th century. The sultan took Lahore after a long siege and battle in which the city was torched and depopulated. In 1021, Sultan Mahmud appointed Malik Ayaz to the throne and made Lahore the capital of the Ghaznavid Empire. As the first Muslim governor of Lahore, Ayaz rebuilt and repopulated the city. He added many important features, such as city gates and a masonry fort, built in 1037–1040 on the ruins of the previous one, which had been demolished in the fighting (as recorded by Munshi Sujan Rae Bhandari, author of the Khulasatut Tawarikh in 1695–1696). The present Lahore Fort stands on the same location. Under Ayaz's rule, the city became a cultural and academic centre, renowned for poetry. The tomb of Malik Ayaz can still be seen in the Rang Mahal commercial area of town. After the fall of the Ghaznavid Empire, Lahore was ruled by Turko-Afghan dynasties based in Delhi, known as the Delhi Sultanate, including the Khiljis, Tughlaqs, Mamluk, Sayyid and Lodhis. During the reign of Qutbu l-Din Aibak, Lahore was known as the 'Ghazni of India'. Scholars and poets from as far away as Kashghar, Bukhara, Samarkand, Iraq, Khorasan and Herat, gathered in Lahore and made it a city of learning. Under Aibak, Lahore had more poets of Persian than any other Islamic city. In 1286, Prince Muhammad, who was the son of Balban was defeated in an encounter with the Mongols in the city. The Mongols invaded and conquered the Khwarazmian dynasty, the King Jalal ad-Din Mingburnu retreated to modern Khyber Pakhtunkhwa but was defeated in the Battle of Indus. The Mongol army advanced and in 1241, the ancient city of Lahore was invaded by 30,000-man cavalry. The Mongols defeated the Lahore governor Malik Ikhtyaruddin Qaraqash and they massacred the entire population and the city was levelled to the ground. There are no buildings or monuments in Lahore that predate the Mongol destruction. In 1266, Sultan Balban reconquered Lahore from the Mongols but in 1296 to 1305 the Mongols again overran northern Punjab. In 1298, 200,000 men Mongol army again conquered northern Punjab and committed atrocities then marched to Delhi but was defeated by the Delhi Sultanate. Though Timur captured the city in 1397, he did not loot it because "it was not rich then". In the early 16th century, Babur, a Timurid descendant of Timur and Genghis Khan from Fergana Valley (modern day Uzbekistan), swept across the Khyber Pass and founded the Mughal Empire, which ended up covering modern day Afghanistan, Pakistan, India and Bangladesh. The Mughals were descended from Central Asian Turco-Mongols. Padshah (emperor) Akbar the Great made Lahore one of his original twelve subahs (imperial top-level provinces), bordering Multan (also in Punjab), Kabul (and later its offshoot Kashmir) and (Old) Delhi subahs. Lahore reached the zenith of its glory during the Mughal rule from 1524 to 1752. Many of Lahore's most renowned sites date from this period, and include the Badshahi Mosque, Wazir Khan Mosque, the Lahore Fort, and the Shalimar Gardens. Mughal Emperor Humayun, his son married Hamida Banu Begum in Lahore while fleeing to Persia. It was also the headquarters of Mughal rule during Akbar between 1584 and 1598. Thus along with Agra and Delhi, Lahore became an "alternate seat" of the Mughal imperial court. Akbar also held discussions with Portuguese missionaries in the city. Abul Fazl, his court historian, calls it "a great city in Bari Doab, in magnificance and populousness it has few equals". The Mughal period in Lahore was interrupted by Nader Shah's brief conquest in early 1739. Before leaving Delhi, later that same year, he gave it back to the Mughal Emperor Muhammad Shah, as with all other Mughal territories to the east of the Indus which he had overrun. During the late 18th century the Mughal Empire was in decline, leading to a power vacuum in the Punjab. Ahmad Shah Durrani, the founder of the Afghan Durrani Empire, took the city between 1747 and 1758. Shortly after defeating the Afghans in the 1757 Battle of Delhi, the Maratha Empire's general Raghunathrao conquered Lahore in 1758, and drove out Timur Shah Durrani, the son and viceroy of Ahmad Shah Durrani. Following invasions of the region by Ahmad Shah Durrani, the Marathas in 1759 planned retaliatory action in to push back the invaders. Sabaji Shinde reached the place with fresh troops along with a large number of Sikh fighters. In the Battle of Lahore, the Afghans were defeated by the combined forces of the Marathas and the Sikhs, in which Jahan Khan lost his son and was himself also wounded. In 1761, following the Afghan victory at the Third Battle of Panipat between the Afghan Durrani and the Maratha Empire, Ahmad Shah Durrani recaptured Lahore from the Marathas. The Bhangi chiefs reoccupied the city when Ahmad Shah returned to Afghanistan in 1767. The Sikh Misls came into conflict with the Durranis, with Bhangi Misl eventually capturing Lahore. The Muslim lands and properties were confiscated by the Sikhs. After Zaman Shah invaded Punjab in 1799, the region was further destabilised, allowing Ranjit Singh to consolidate his position in the aftermath of the invasion. Singh entered into battle with Zaman, and was able to seize control of the region after a series of battles with the Bhangi Misl and their allies. After capturing the Lahore, the Sikh army immediately began plundering the Muslim areas of the city until their actions were reined in by Ranjit Singh. Thereafter, Lahore then served as the capital city of the Sikh Empire. While much of Lahore's Mughal era fabric lay in ruins by the end of the 18th century, the Sikh rulers plundered most of the Lahore's most precious Mughal monuments, and stripped the white marble from several monuments to send to different parts of the Sikh Empire. Monuments plundered of their marble include the Tomb of Asif Khan and the Tomb of Nur Jahan. The Shalimar Gardens were plundered of much of its marble which was transported to decorated the Ram Bagh Palace in nearby Amritsar, while the gardens' costly agate gate was stripped and sold by Lehna Singh Majithia, one of the governors of Lahore during Sikh rule. 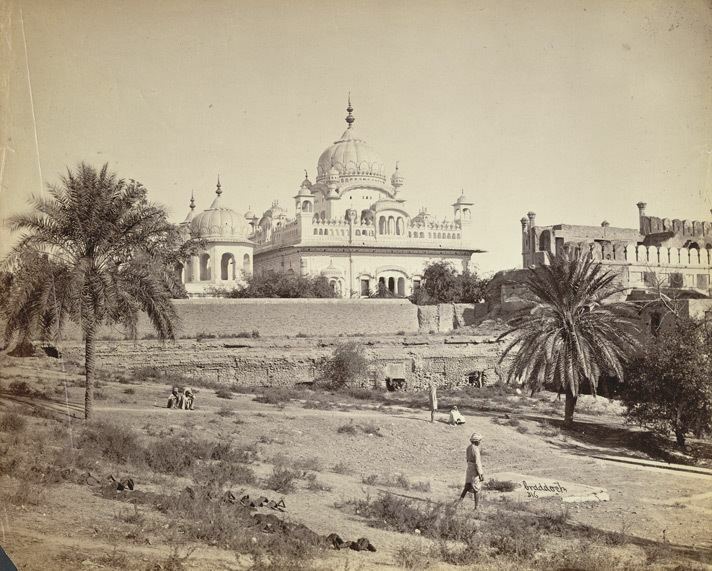 Ranjit Singh's army also desecrated the most of the important Mughal mosques in Lahore and some were confiscated including the Abdullah Khan Masjid. The Badshahi Mosque was also confiscated and converted it into an ammunition depot and a stable for Ranjit Singh's horses. The Golden Mosque in the Walled City of Lahore was also converted to a gurdwara for a period of time, while the Mosque of Mariyam Zamani Begum was repurposed into a gunpowder factory. Ranjit Singh's son, Sher Singh, continued the pattern of the desecrating Mughal mosques by mounting weaponry to Badshahi Mosque's minarets in order to target his political opponents in the nearby Lahore Fort, destroying the fort's historic Diwan-e-Aam. Rebuilding efforts under the Sikh Empire were influenced by Mughal practices. Ranjit Singh himself moved into the Mughal palace at the Lahore Fort and re-purposed it for his own use in governing the Sikh Empire. By 1812 Singh had mostly refurbished the city's defences by adding a second circuit of outer walls surrounding Akbar's original walls, with the two separated by a moat. Singh also partially restored Shah Jahan's decaying gardens at Shalimar. Later British maps of the area surrounding Lahore dating from the mid-19th century show many walled private gardens which were confiscated from the Muslim noble families bearing the names of prominent Sikh nobles – a pattern of patronage which was inherited from the Mughals. The Sikh court continued to endow religious architecture in the city, including a number of Sikh gurdwaras, Hindu temples. After the conclusion of two Anglo-Sikh wars, the British East India Company first seized control of Lahore in 1846, and the remainder Punjab by 1849. At the commencement of British rule, Lahore was estimated to have a population of 120,000. 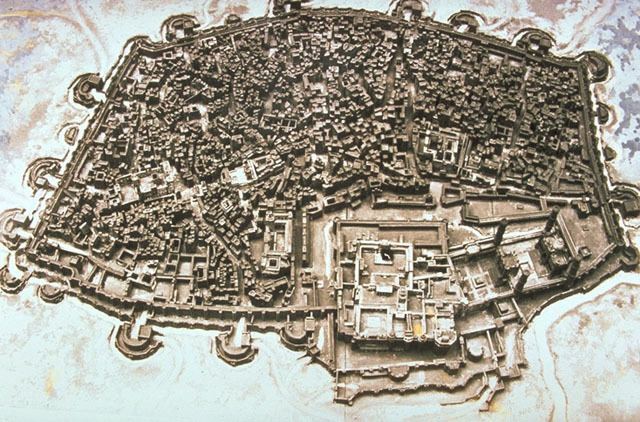 Prior to annexation by the British, Lahore's environs consisted mostly of the Walled City surrounded by plains interrupted by settlements to the south and east such as Mozang and Qila Gujar Singh, which have since been engulfed by Lahore. 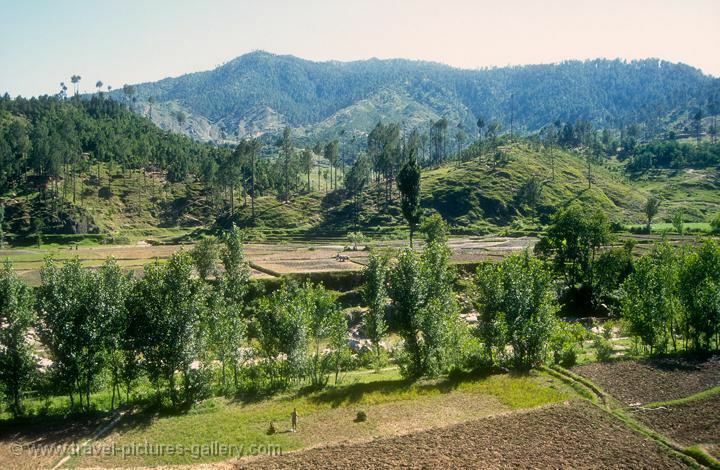 The plains between the settlements also contained the remains of Mughal gardens, tombs, and Sikh-era military structures. The British viewed Lahore's Walled City as a bed of potential social discontent and disease epidemics, and so largely left the inner city alone, while focusing development efforts in Lahore's suburban areas, and Punjab's fertile countryside. The British instead laid out their capital city in an area south of the Walled City that would be come to known as "Civil Station." The British built the Lahore Railway Station just outside the Walled City shortly after the Mutiny of 1857, and so built the station in the style of a medieval castle to ward of any potential future uprisings, with thick walls, turrets, and holes to direct gun and cannon fire for defence of the structure. Lahore's most prominent government institutions and commercial enterprises came to be concentrated in Civil Station in a half-mile wide area flanking The Mall, where unlike in Lahore's military zone, the British and locals were allowed to mix. The Mall continues to serve as the epicentre of Lahore's civil administration, as well as one of its most fashionable commercial areas. The British built several notable structures near The Mall, including the neoclassical Montgomery Hall, which today serves as the Quaid-e-Azam Library. Lawrence Gardens were also laid near Civil Station, and were paid for by donations solicited from both Lahore's European community, as well as from wealth locals. The gardens featured over 600 species of plants, and were tended to by a horticulturist sent from London's Royal Botanic Gardens at Kew. The British also laid the spacious Lahore Cantonment to the southeast of the Walled City at the former village of Mian Mir, where unlike around The Mall, laws existed against the mixing of different races. The British authorities built several important structures around the time of the Golden Jubilee of Queen Victoria in 1887 in the distinct Indo-Saracenic style. The Lahore Museum and Mayo School of Industrial Arts were both established around this in this style. Other prominent examples of the Indo-Saracenic style in Lahore include Lahore's prestigious Aitchison College, the Punjab Chief Court (today the Lahore High Court), and University of the Punjab. Many of Lahore's most important buildings were designed by Sir Ganga Ram, who is sometimes called the "Father of modern Lahore." The British carried out a census of Lahore in 1901, and counted 20,691 houses in the Walled City. An estimated 200,000 people lived in Lahore at this time. Lahore played an important role in the independence movements of both India and Pakistan. The Declaration of the Independence of India was moved by Jawaharlal Nehru and passed unanimously at midnight on 31 December 1929. The Indian Swaraj flag was adopted this time as well. Lahore's jail was used by the British to imprison independence activists such as Jatin Das, and was also where Bhagat Singh was hanged. Under the leadership of Muhammad Ali Jinnah The All India Muslim League passed the Lahore Resolution in 1940, demanding the creation of Pakistan as a separate homeland for the Muslims of India. Upon the independence of Pakistan, Lahore was made capital of the Punjab province in the new state of Pakistan. Almost immediately, large scale riots broke out among Muslims, Sikhs and Hindus, causing many deaths as well as damage to historic monuments—including the Lahore Fort, Badshahi mosque and colonial buildings. After independence and its deep impact, Lahore as so many times before, once again gained its significance as an economic and cultural powerhouse of the region, through government reforms. The second Islamic Summit Conference was held in the city in 1974. With United Nations assistance, the government was able to rebuild Lahore, and most scars of the communal violence of independence were erased. Less than 20 years later, however, Lahore once again became a battleground in the War of 1965. The battlefield and trenches can still be observed today close to the Wagah border area. In 1996, the International Cricket Council Cricket World Cup final match was held at the Gaddafi Stadium in Lahore. 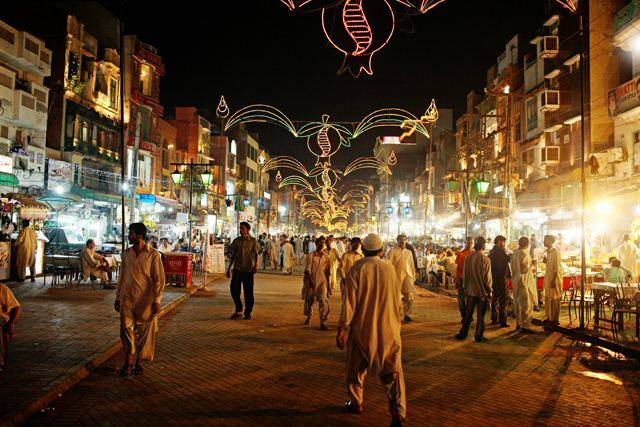 Lahore's modern cityscape consists of the historic Walled City of Lahore in the northern part of the city, which contains several world and national heritage sites. Lahore has more Mughal-era monuments than Delhi, India, and structures from this era are now amongst the most iconic features of Lahore. Thirteen gates surrounded the history walled city. Some of the remaining gates include the Raushnai Gate, Masti Gate, Yakki Gate, Kashmiri Gate, Khizri Gate, Shah Burj Gate, Akbari Gate and Lahori Gate. Southeast of the walled city is the spacious British-era Lahore Cantonment. Lahore is home to numerous monuments from the Mughal Dynasty, Sikh Empire, and British Raj. Pakistan's Department of Archaeology has excavated many architectural remains of the buildings that were built during the rule of Rama of Ayodhya. The architectural style of the Walled City of Lahore has a strong influence of the Mughal style, and includes Mughal monuments such as the Badshahi Mosque, Lahore Fort, Shalimar Gardens, the mausolea of Jehangir and Nur Jahan. Other examples of Mughal architecture include: Jahangir’s Quadrangle, Maktab Khana, Khilwat Khana, Picture Wall, Kala Burj and Hathi Paer. As capital of British Punjab, the area south of the Walled City contains many British colonial municipal structures built in the Indo-Saracenic style, such as the General Post Office, and Lahore Museum. The predominant architectural style is a mixture of Victorian and Islamic architecture, and is often referred to as Indo-Gothic. An interesting point about Lahore's architecture is that unlike the emphasis on functional architecture in the west, much of Lahore's architecture has always been about making a statement as much as anything else. One of Lahore's nicknames is the "City of Gardens." Many gardens were established in Lahore during the Mughal era, some of which still survive. The Shalimar Gardens were laid out during the reign of Shah Jahan and were designed to mimic the Islamic paradise of the afterlife described in the Qur'an. The gardens follow the familiar charbagh layout of four squares, with three descending terraces. The Lawrence Garden was established in 1862 and was originally named after Sir John Lawrence, late 19th-century British Viceroy to India. The many other gardens and parks in the city include Hazuri Bagh, Iqbal Park, Mochi Bagh, Gulshan Iqbal Park, Model Town Park, Race Course Park, Nasir Bagh Lahore, Jallo Park, Wild Life Park, and Changa Manga, a man-made forest near Lahore in the Kasur district. Another example is the Bagh-e-Jinnah, a 141-acre (57 ha) botanical garden that houses entertainment and sports facilities as well as a library. According to the 1998 census, Lahore's population was 6,318,745. An estimate in January 2015 gave the population of the Lahore agglomeration as 10,052,000. The results of the 2017 Census determined the population to be at 11,126,285, with an annual growth rate of 4.07% since 1998. Gender-wise, 52.35% of the population is male, while 47.64% is female and transgenders make only 0.01% of the population. According to the 1998 census, 94% of Lahore's population is Muslim, up from 60% in 1941. Other religions include Christians (5.80% of the total population, though they form around 9.0% of the rural population) and small numbers of Bahá'ís, Hindus, Ahmediya, Parsis and Sikhs. As of 2008, the city's gross domestic product (GDP) by purchasing power parity (PPP) was estimated at $40 billion with a projected average growth rate of 5.6 percent. This is at par with Pakistan's economic hub, Karachi, with Lahore (having half the population) fostering an economy that is 51% of the size of Karachi's ($78 billion in 2008). The contribution of Lahore to the national economy is estimated to be 13.2%. As a whole Punjab has $115 billion economy making it first and to date only Pakistani Subdivision of economy more than $100 billion at the rank 144. Lahore's GDP is projected to be 102 billion$ by the year 2025, with a slightly higher growth rate of 5.6% per annum, as compared to Karachi's 5.5%. The Lahore Metro or Lahore Rapid Mass Transit System (LRMTS) was first proposed in 1991. Funding was not secured, and in 2012 it was abandoned by the Punjab Government in favour of the more cost–effective Lahore Metro Bus System which opened in February 2013. However, in May 2014 the Punjab Government decided to restart development on the Lahore Metro as a $1.6 billion project with Chinese assistance. The Orange Line, which will be 27.1-kilometre (16.8 mi) long, (25.4 kilometres (15.8 mi) of which will be elevated), will be the first line of the project and is under construction. Several bus companies operate in Lahore. Premier Bus Services, owned by the Beaconhouse Group, was started in 2003, and provides transportation services to the general public in Lahore. With over 240 buses running on exclusive routes, it is the largest public transport company in Pakistan. As of 2010, the buses are in the process of being converted to compressed natural gas for environmental and economic reasons. Sammi Daewoo's City Bus Division operates three routes within the city and two suburban routes for Gujranwala and Sheikhupura. The Daewoo City Bus also operates routes within Lahore. Its headquarters are located in the city of Lahore. It is operated by a Korean company, Sammi. On 11 February 2013, Punjab Government launched Rapid Bus Transit System (MBS) in Lahore. The government built a new city airport in 2003. It was named Allama Iqbal International Airport after the national poet-philosopher of Pakistan, Allama Muhammad Iqbal, and is served by international airlines as well as the national flag carrier, Pakistan International Airlines. The old terminal now operates as the Hajj terminal to facilitate the great influx of pilgrims travelling to Saudi Arabia to perform the Hajj every year. Lahore also has a general aviation airport known as Walton Airport. The second closest commercial airport is in Amritsar, India. The people of Lahore celebrate many festivals and events throughout the year, blending Mughal, Western, and other traditions. Eid ul-Fitr and Eid ul-Adha are celebrated. Many people decorate their houses and light candles to illuminate the streets and houses during public holidays; roads and businesses may be lit for days. The mausoleum of Ali Hujwiri, also known as Data Ganj Bakhsh (Punjabi: داتا گنج بخش) or Data Sahib, is located in Lahore, and an annual urs is held every year as a big festival. Basant is a Punjabi festival marking the coming of spring. Basant celebrations in Pakistan are centred in Lahore, and people from all over the country and from abroad come to the city for the annual festivities. Kite-flying competitions traditionally take place on city rooftops during Basant. Courts have banned the kite-flying because of casualties and power installation losses. The ban was lifted for two days in 2007, then immediately reimposed when 11 people were killed by celebratory gunfire, sharp kite-strings, electrocution, and falls related to the competition. Gaddafi Stadium is a Test cricket ground in Lahore. Designed by Pakistani architect Nayyar Ali Dada, it was completed in 1959 and is one of the biggest cricket stadiums in Asia. Lahore is home to several golf courses. The Lahore Gymkhana Golf Course, the Lahore Garrison Golf and Country Club, the Royal Palm Golf Club and newly built DHA Golf Club are well maintained Golf Courses in Lahore. In nearby Raiwind Road, a 9 holes course, Lake City, opened in 2011. The newly opened Oasis Golf and Aqua Resort is another addition to the city. It is a state-of-the-art facility featuring golf, water parks, and leisure activities such as horse riding, archery and more.The Lahore Marathon is part of an annual package of six international marathons being sponsored by Standard Chartered Bank across Asia, Africa, and the Middle East. More than 20,000 athletes from Pakistan and all over the world participate in this event. It was first held on 30 January 2005, and again on 29 January 2006. More than 22,000 people participated in the 2006 race. The third marathon was held on 14 January 2007. Plans exist to build Pakistan's first sports city in Lahore, on the bank of the Ravi River.